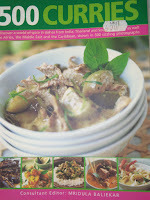 One simple and easy vegetable dish recipe for '500 Curries'. The recipe looks complicated but I made it simple with some modifications. The result is as good if you have not seen the original, hehehe!. 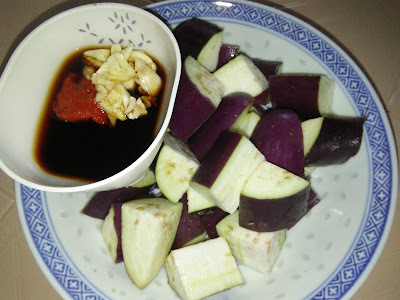 I love the spicy flavour and the tangy taste which blends well with the sweet taste of aubergine/eggplant/brinjals. This is the description of the Chef of this recipe. 'Chunks of aubergine coated in a rich sauce and sprinkled with sesame seeds makes an unusual side dish that is quick to cook. 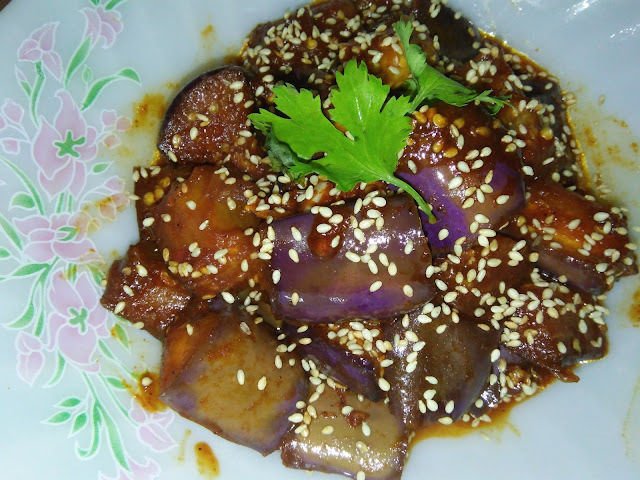 A versatile vegetarian dish that can be served hot, warm or cold'. A dish well describer and it's a must try if you like aubergine. Sprinkle cut aubergine with salt and leave to stand for 15-20 minutes. In a colander, rinse well and drain off excess water. Sprinkle chilli powder and toss well. Meanwhile, combine seasoning ingredients in a small bowl. Set aside. 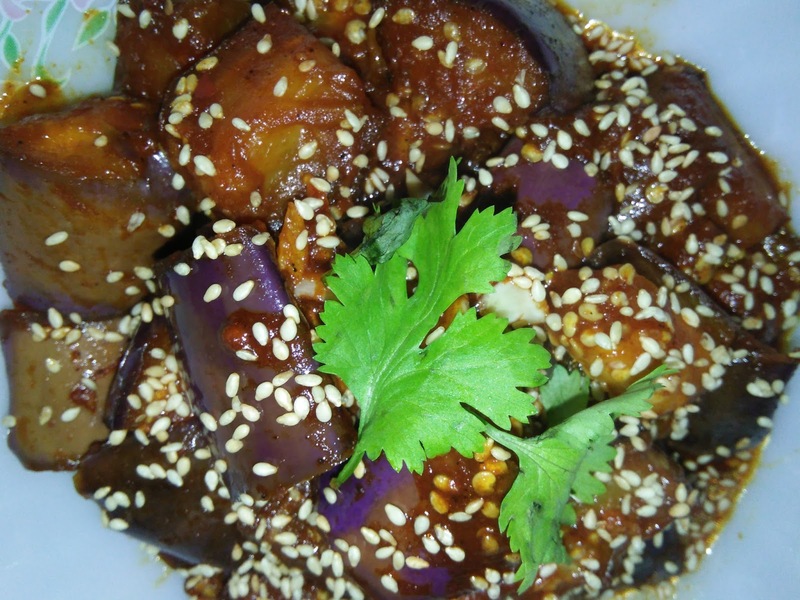 In a non-stick pan, heat oil until hot, fry aubergine chunks. Stir constantly until a little brown, pour in water. Cover to pan for 1-2 minutes to steam. 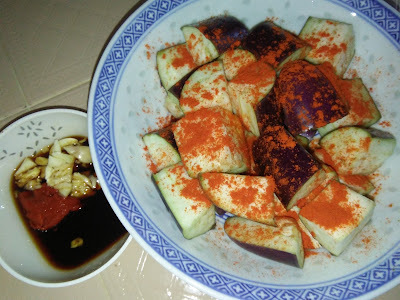 Add in seasoning ingredients. Taste to adjust seasoning. 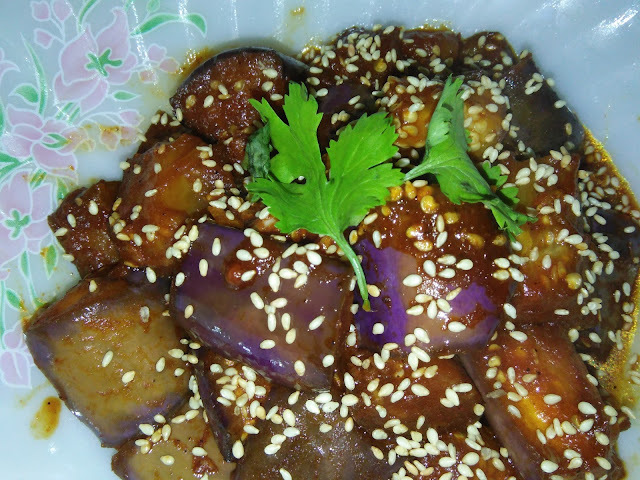 Sprinkle sesame seeds and dish up to serve. Sprinkle more sesame seeds if preferred. Hi Phong Hong, the recipe is simple but probably it is layout that makes it look complicated. Can deter people from trying, lo... You will like it. It is nice. This is similar to a recipe I once tried from a Korean cookbook. 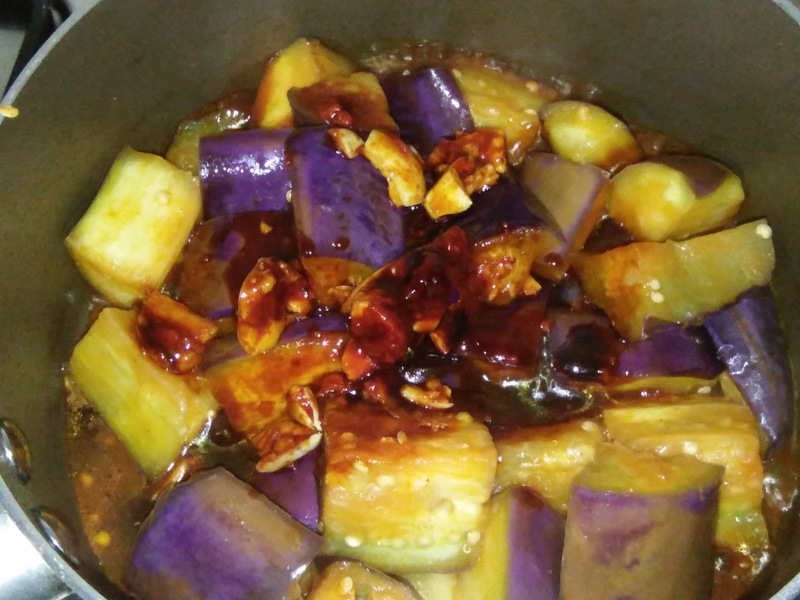 I love brinjals cooked in any style, and I could eat a plateful of this on its own! 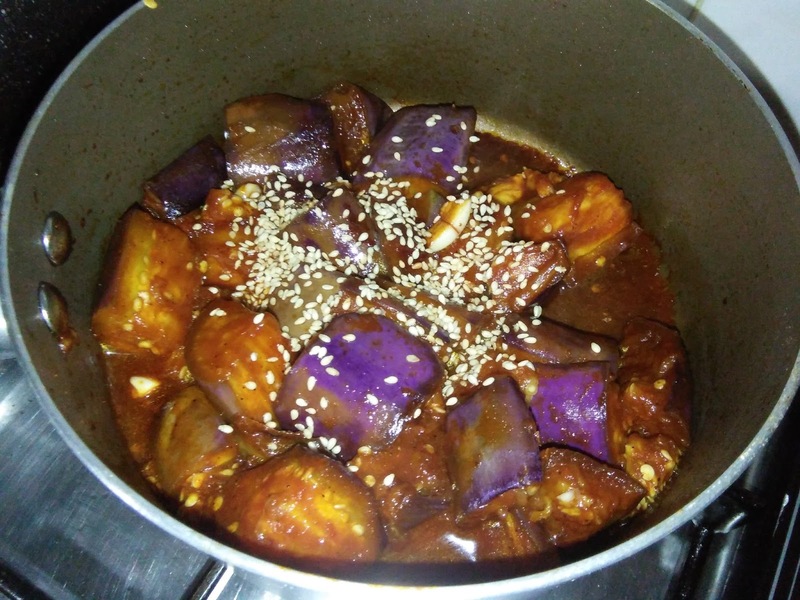 Hi Lissa, the original recipe uses about 6 tbsp of oil but I have reduced it to 1-2 tbsp. 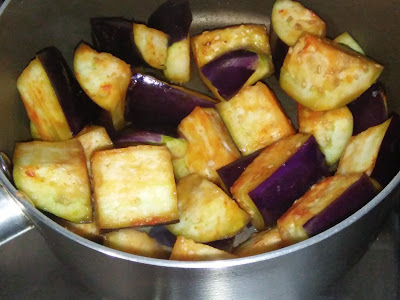 After frying the eggplant [cut sides facing down] until a little brown, pour in some water, then cover to cook till it is tender. This way, you need not use much oil. 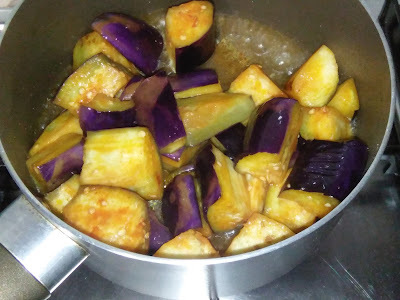 Eggplants are quick to cook when you cover to steam cook it. Another way is to deep fry in hot oil [nice colour but greasy]. You can steam eggplants then pour sauce over it to serve. It is also good.